TIPS: The Delivery Time is about 7-15 Business Days, Usually You Can Receive the Item in about 7-10 days!!! ▶Soft and comfortable, skin-friendly and good for your health. ▶Anti-bacterial, deodorant, mold resistant, non-slip, strong water absorption. ▶Easy to clean and dry fast, can machine washable. ▶Non-slip composite non-woven fabric helps prevent the rug from sliding. ▶Large rug can cover a large area of floor, keeping your floors dry and clean. ▶Perfect for home decorate, children play, women yoga and pets carpet. GIY Home`s other collections have variety of sizes and styles in area rugs, rugs runners and doormats for the living rooms, bedrooms, kitchens, Balcony, Bathroom, hallways, entryways, teen rooms, guest rooms, kids and nursery rooms. 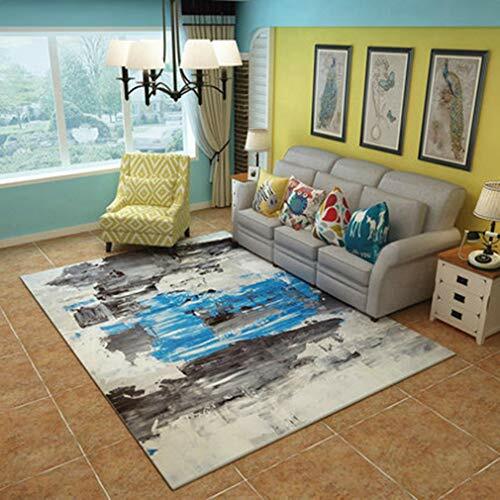 SUPER SOFT AND COMFORTABLE: This modern area rug is machine woven with breathable anti-skid Composite non-woven fabric bottom prevent the rug from sliding. Super soft comfortable skin-friendly plush promotes an incredibly soft feeling underfoot. EASY CLEAN AND DRYING FAST: Virtually stain，mold resistant and fade-resistant for fuss-free maintenance, It easy to clean and dry fast, non-slip and machine washable. MULTI-FUNCTION: Anti-bacterial, deodorant, non-slip, strong water absorption and good for your health, The contemporary area rug adds the perfect modern touch to your space. That's timeless designs stand out in any room, Suitable for home decorate, children play, women yoga and pets carpet. Ensuring it will be a favorite for a long time. If you have any questions about this product by GIY, contact us by completing and submitting the form below. If you are looking for a specif part number, please include it with your message.